Each month Hero Arts comes out with a kit and add-on items that compliment one another. I used some of the add-ons to the kit to create a mini card with trifold envelope. I stamped the XO repeatedly onto the front flap of the envelope and then added some spring type papers. I stamped additional images to add and attached the heart just at the top so once the envelope is closed, the heart sits on top. I attached papers to the inside of the envelope and added some stamping and postage stamp frame to complete my design. The add-ons to the kit are available in the Simon Says Stamp store. 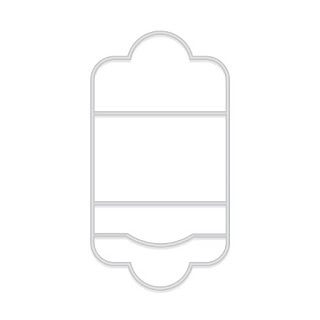 Check out what I've used in my mini notecard by clicking on the images below. Hero is giving away a kit to one lucky winner from all the comments along the hop. Be sure to comment on each blog post along your way. Giveaway closes Sunday, January 15 at 11:59pm, and the winner will be announced the following week. Thanks for Stopping by, have a great week!! I love the mini note. The Mini Mailer die is fantastic! The add on pieces are great all by themselves. Love your colorful take on Valentines cards. What a darling mini note, Shari - such a perfect Valentine!! Shari, your card is super cute! Super cute! Would make great lunch box notes! Beautiful and colorful creations ! So pretty! Love all the colors! This is cute! Love the XO background look. Thanks for sharing on this great blog hop for Hero Arts!! Your mini card and trifold envelope is very darling and cute!! Oh these are so cute and clever! Thanks for the lovely cards. Thanks for the blog hop. Like the non-traditional colors used! What a super cute mini card and envelope! Love the colors too. Love your card and the happy colors! So inspirational. Thanks for sharing. I love the different colors and prints, and of course the XOXO! Oh these are cute little things! Valentine cuteness & versatility for many other occasions. SO clever - and the colors are just wonderful! TFS! So pretty - your colors just pop! This month's Kit is awesome! Love your sweet note card inside and out, Shari! What a cute fun mini note! Love the colors you used. This is such a cute little mini card/envelope. Love all the fun items in this month's kit! I am loving all the envelope creations happening these days. Just started doing it myself lately. Its so fun and really completes the gift of a card. TFS! YOURS IS ADORABLE! 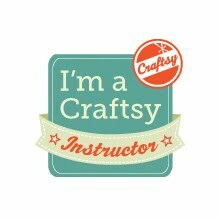 Love the mini note die~perfect for a little something for all the kids in my class. Thanks for the great idea. Wow! How fab is this, Shari (and so you!). I love the colors you used and the neat way you used this die - love little notes like these since they are so easy to slip into lunch boxes or briefcases. I love the use of non-traditional colors for Valentines Day. 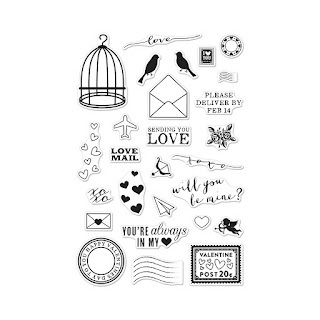 This is a great HA kit, because so many of the stamps can be used for other times besides Valentines! Your mini fold card and envelope are very cute! Love all the XO on the flap! Love the complete move away from traditional Valentines colours, so refreshing. The repeated background stamping is so effective. Gorgeous! What a pretty set of cards. This is such a cute kit. I love the little envelope dies. Great card. I love the rainbow of colors! 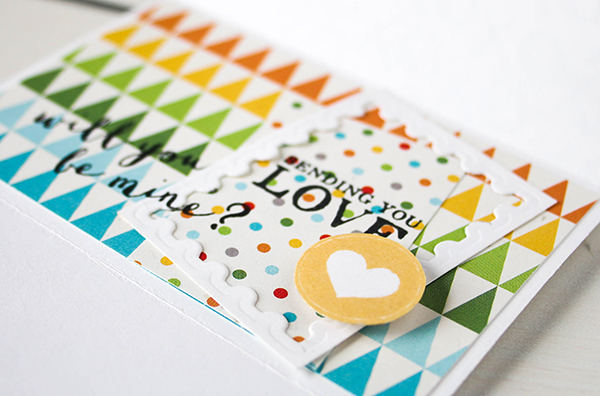 Cute mini mailer die and I love what you did with it! This is colorful. My grandson would love it! 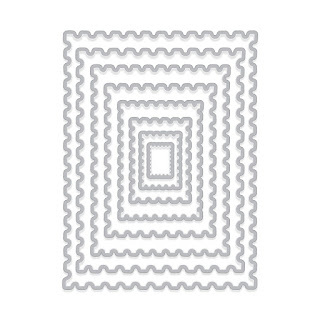 What a cute envelope die! Love the card and color choices! This is unique and fun! so cute Shari - and love that you used spring colors! Great card. I love seeing all of the different cards made with the same set. So fun! Love what you did with these add on dies Shari. 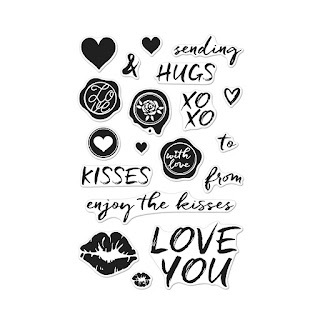 Hugs and kisses says it all.. Such a bright and cheerful mini card and envelope,love all the layers. Great kit. Love the mini card and envelope..those colors are pretty!! What a fun and happy card Shari. I love all your wonderful stamping and layering. Thanks for sharing with us. Another great idea to try out! Thank you so much! Now that's really cute. Great blend of patterns. Love your card today.. all the colors and layers are so wonderful! Digging the unusual color scheme!! You always manage to think outside the box, which is where I normally land as well. And I am totally loving the stamp frame! Great.use of fun colors. Thanks for sharing. Great project and awesome kit. What a great use of color! Thank you for sharing. Terrific add-ons for this kit. Fun and cute for Valentines day, even kids could use it for classmates! So many fun ways to use all these extras. TFS! Such a bright, cheery showcase of this set. I could see making multiples of these for my niece's Grade 1 class! Simply marvelous! Such cute cards! I love these for children especially. Very cute. I like your choice of papers. Vibrant colors immediately caught my attention...so FUN... thanks for sharing! Love your mini note card, super cute. What a fun little project! Love your pattern mix and "Will you be Mine?" Thanks for the colorful and eye-catching design. Vibrant colors immediately caught my attention...so FUN...thanks for sharing! This is a great little card - love all your special touches!! Thank you! Your cheery card would brighten most any winter day! The add-on sets are great! This adorable card just makes me happy! 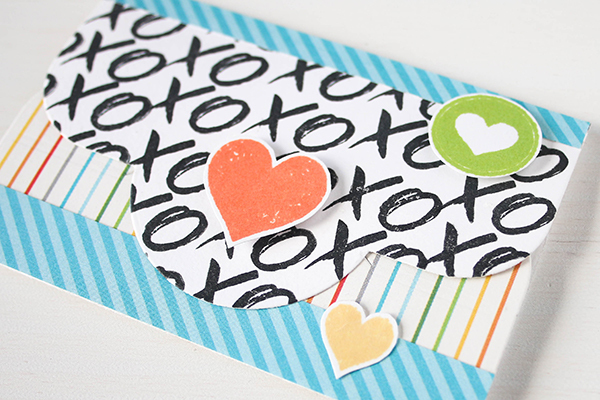 Love the bright cheery colors & that awesome little envelope! So many inks to play with - love this kit. Super cute design!!! LOVE the colors!! Love your cards! Such a unique use of colors for a "love" card! LOve this mini mailer and the colors you used. Pretty cool card! Didn't think those word stamps can be used to create a such fun background! and the colors you used are so 'fun' as well! I can always count on you for happy, non-predictable colors! I love the mailer dies, too. LOVE your mini card and this awesome card kit!! My favorite is the Postage Stamp Infinity die set, but everything is great. That is the best card! The color is so fresh and I would love to receive a Valentine like that! Love seeing your creation from the add-on's. I'm sure the kit will sell out fast, "cause it's great". Inspired and I ordered the Kit along with Love Notes stamp set. Thank you for sharing your adorable hero arts work!! This is just sweet Shari. The add on's are amazing as is the kit! You are so clever when it comes to your creativity. 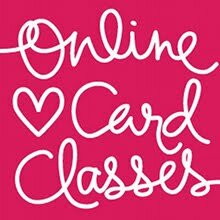 Enjoy your blog and the process you use to make your cards or projects. thanks for sharing. Really cute.. love the color and trifold. This is super cute. Love everything about this new kit. Love both cards. Great colors and layers. Well done. What a fabulous kit. Your card is so much fun. 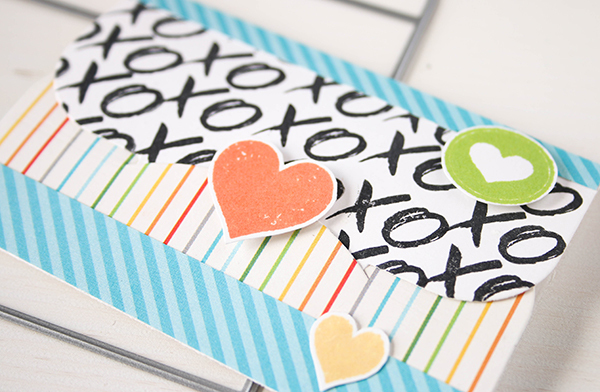 Cute envelope--love the XO background! I love al the colors, they make me happy! Love your use of bright colors on a fun project! I love the mini note- but your circle of leaves is a beauty! I love the sweet and colorful mini note! Fabulous! I love the bright colors you chose! Very bright & lively. Love it! I love the bright colors you used. Such a cute project. Love the colors. Absolutely charming! The color combo makes it pop!! Love the cards and kit, Shari. Thanks so much for sharing your ideas! Love the envelope and the heart! I love all the fun and color you've packed into these small designs!! What a great way to brighten someone's day! So cute, cute, cute! Love the tuck in. Great job! cutecard!!! I love this kit and can't wait to get it!!! What a great idea to do a mini card! The card looks great and so does the envelope. Very cheerful! I love what you did with the XOXO's! Such colorful creativity for a cute Valentine! What a happy card - puts a smile on my face! Bright colors and the little postage frame makes such a sunny card and in Ohio we need the sunshine! Wow, so cute and happy! I love it! Such Fun and colorful cards! Love them! Thank you so much for the inspiration and the opportunity to win this generous gift! Would love to win this! Awesome inspiration from an awesome kit! Love how bright and cheerful the whole thing is. Shari...your mini tri fold card is just adorable...Soooo CREATIVE!!! I loved the Xs and Os on the outside of the card and the heart helping it to stay closed! Such a great card and I love the mini note, so cute. Love all the colors. So cute. Great dies! Thanks for sharing! Love the mini note! Adorable! cute! what a nice change! very very nice job! Bright, bold, and graphic! Super! Wow! Such fantastic project!!! Beautiful colors!!! Love this kit!!! Bright colors and I love the set too. Happy, fun and beautiful colors! What a fun and colorful card! Love it!! This card is so cute! I love the tri fold card. Awesome kit, very neat mailer...love it! Love your fun + fresh colors! The design and colors are so pleasant! I love receiving Valentine's Day! Great card! I might need the stamp set with the XO. I could use it for so many cards. Very cute card. I love that postage stamp die. WOW... that is gorgeous colors for love theme card! I was hoping to see the mini mailer die in action. It caught my eye right away! And now that I see what you've created, I know why! So cute Shari! Love the stamps and colours used on the mini note. I like the non trad colors. The colours you used are so bright & eye-catching - these are gorgeous! Love the vibrant, fun colors! Its eye-catching! Love all the colors in this card! Absolutely delightful! Love these bright and happy colors! I am loving this mini note envelope!! Your creation is just fabulous with the colours and the patterned papers! I need to get bold and try that as any time I've seen it done I love it but when I go to do it I find it too busy/crazy. Next time I may just have to do it no matter what. Thanks for the inspiration!! How cute! Love the colours you used. Great little card for anyone! I just love the bright colors! So creative. Adorable mini note and the fun, bright colors!